Every year I have some family over for a traditional St. Patrick's Day dinner. It's one of our favorite traditions! I usually don't make invitations, but when I saw this stamp from My Creative Time's "I Believe in Leprechauns" stamp set, I couldn't resist! I'm entering this card into My Creative Time's Throwback Thursday Challenge: use any of the older cartridges and have a St. Patrick's Day theme. This invitation is a postcard style; I'll just write the info on the back. I made my polka-dotted paper using Spring Moss Ink and the "Polka Dot Basics" stamp set from Papertrey Ink. My pot, cut at 2.6" from the From My Kitchen cartridge, was created on the Imagine using a pattern from the Imagine More cartridge. I printed an extra square of that pattern to use for my die cut button. 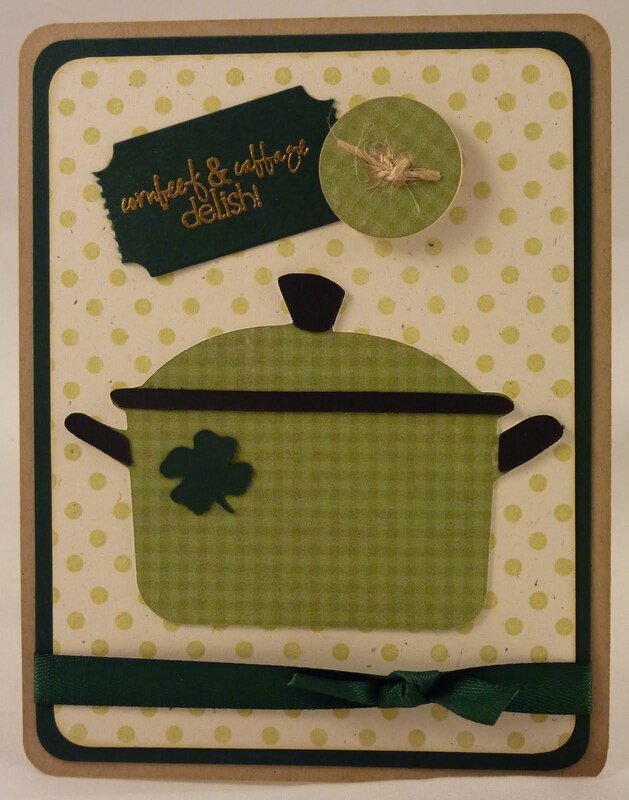 The little shamrock was cut at 0.7" from Designer's Calendar. 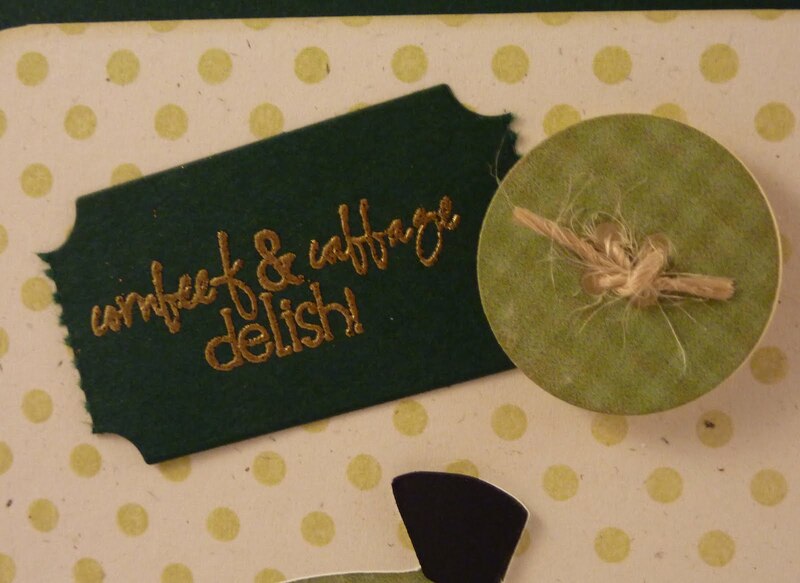 Lastly, I heat embossed gold embossing powder for my sentiment. I love this card! Eating cornbeef and cabbage on St. Paddy's is a tradition in my house! That is too cute! I love to have corned beef and cabbage (and potatos too) for St. Patty's Day. Yearsss ago, you could go to a bar/restaurant on that day and buy a dinner plate for $3.17! Oh how times have changed! adorable! and that's my fav dish! Have a great week. I woke up to more snow! Very cute invitation! Like the embossing too! Thanks for sharing! cute card Katie, love the embossed sentiment. OMG!!! SOOOO CREATIVE & JUST PERFECT!!!!! Very cute card! Luv how you did the sentiment embossing. The little pot was perfect for it! Thank for sharing. So cute and so creative----I love it----------------you deserve an award!!!!!! Wow great job,your card is super nice!!!! LOVE IT!!! I remember when I use to stay up and wait for Emma to post her TT!!! I had to be the first!!! LOL Love how you stamped the sentiment!!!!!! This is super cute, and way original! I always love to see your amazing cards. Super cute Katie.